MUSICOIN OFFICIALLY RELEASES ITS MOBILE APP (V1), UNLOCKING THE TRUE POWER OF BLOCKCHAIN FOR LISTENERS AND MUSICIANS. What if musicians could be compensated fairly and automatically on a world-class streaming platform? 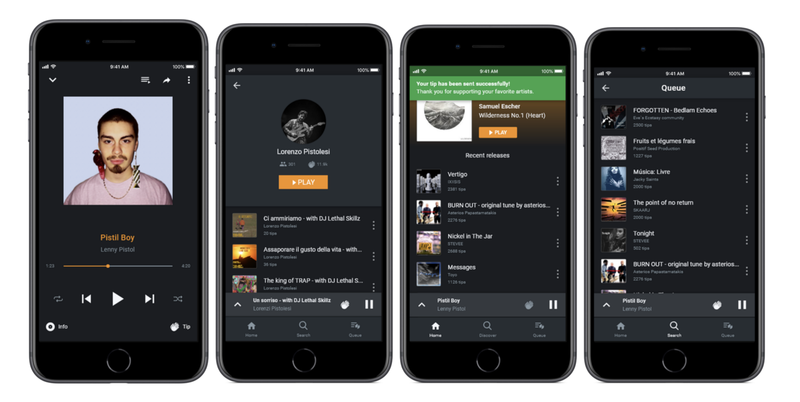 What if fans and listeners could play their favorite tunes for free? Musicoin is a pioneering example today of what blockchain could do for the entire music streaming business tomorrow. Version 1 of the app is now free to download on the App and Google Play stores. Musicoin conceived a new form of shared economy in which every contributor gets paid for their contribution. Universal Basic Income (UBI), Musicoin’s fair revenue model for musicians and fans, stems from the platform’s forward-thinking development powered by the blockchain. The promise Musicoin has made is twofold: to compensate musicians fairly on the Musicoin blockchain, allowing direct automatic payment in $MUSIC — Musicoin’s own cash transferable cryptocurrency. At the same time, fans can browse, play, and share music for free, no subscription fees or ads while supporting artists directly. “The Musicoin Project started from a simple philosophy, to remunerate creators because they shared valuable creations. The philosophy, dubbed as Sharism, is leading our products design, development, and delivery to all stakeholders.” Isaac Mao, Founder. Enticing numbers reveal how Musicoin plans to shake the global USD 17 billion music business. Today, 5,500 musicians, 77,000 tracks, 7,500,000 streams and 10,200,000 tips (an exclusive feature available on the app that shows support from fans to a track or artist) have made Musicoin an early success. Founded by innovative leaders in both the music and the blockchain worlds, the Musicoin project is the first of its kind to have launched a solid and beautifully designed app, which fans and musicians can start enjoying. “Finally we have a platform which allows musicians to be paid fairly. This was long overdue, maybe even 50 years.” Ben Gyles, Mobile App Developer. “Musicoin (app) is not merely designed to compete with another streaming platform, it’s designed to revolutionize our mindset of fairness.” Gibran Septya, Designer. Musicoin is the only streaming app emerging from blockchain technology with a scalable, sustainable vision. The team will continuously refine the product along the year, adding more features (speed enhancements, personal login, playlists…) as well as building up a global community and empowering artists. Musicoin (MUSIC) is a smart cryptocurrency ($MUSIC) and music streaming platform built upon the Musicoin blockchain. Musicians and listeners worldwide are encouraged to visit Musicoin’s official website at musicoin.org . Musicoin Mobile App can be downloaded on Google Store and App Store.